An evaluation form is a document that is generally used to evaluate a particular person, thing or a situation. The form comprises of questions based on some important parameters which make the whole evaluation process easy. 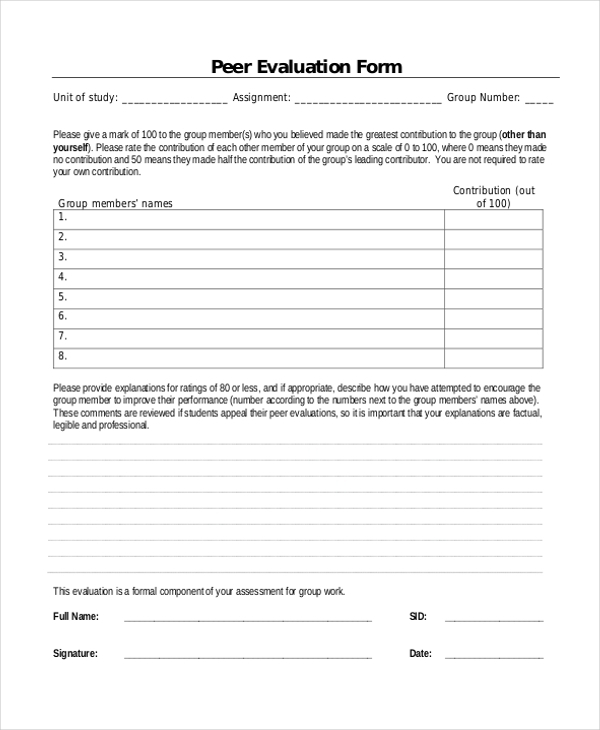 An evaluation form can be used by an organization to evaluate its employees’ performances. It could also be used to evaluate other services as well as situations. The questions and subheads can be altered based on the person or thing being assessed. 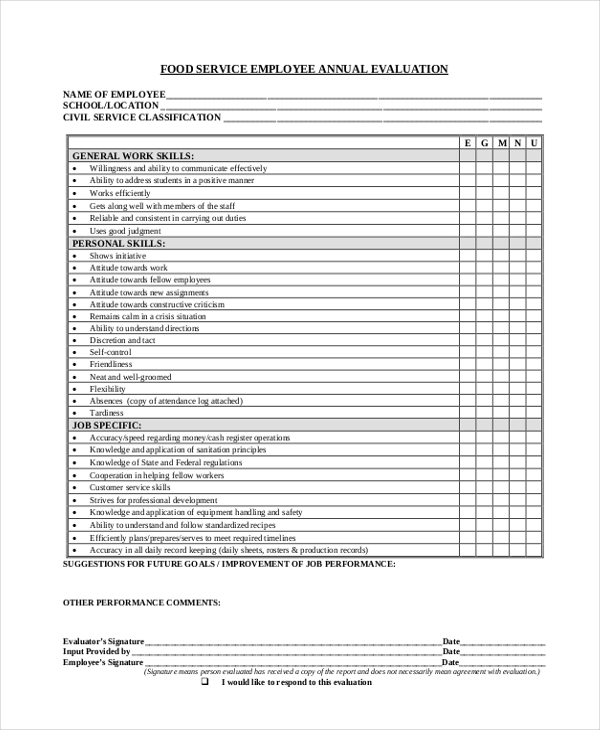 As might be evident from the name, this form is used by an employer or a business organization to evaluate the performance of its employees during the year. It can also be used to evaluate the performance of the company in a financial year. 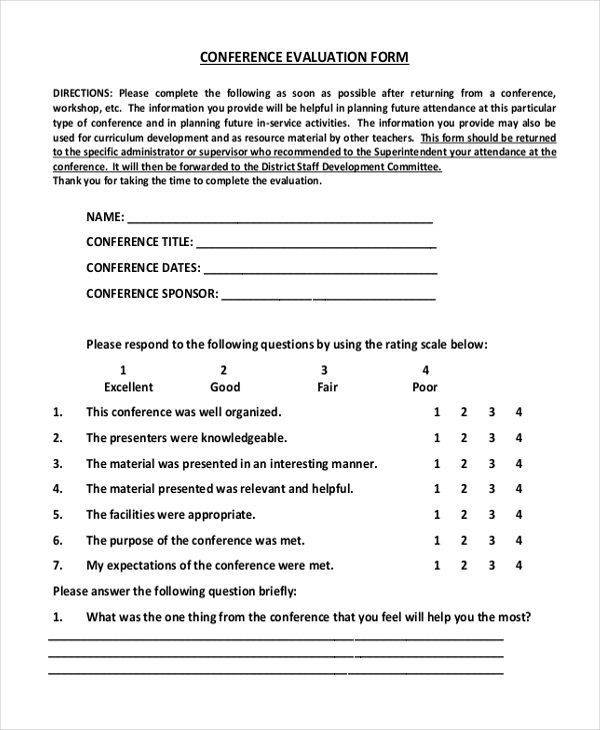 This form is used by the organizers of a conference to understand what the participants think of the conference. The result helps them to analyze what improvements they need to make. An interviewer uses a candidate evaluation form to assess a candidate he might have interviewed. He fills the form with all relevant details about the candidate which makes the hiring process easier for the HR team. A contractor who might have offered his services to a client. He hands over this form to him and urges him to fill it up. The details filled in by client gives the contractor an idea about how he can improve his services. 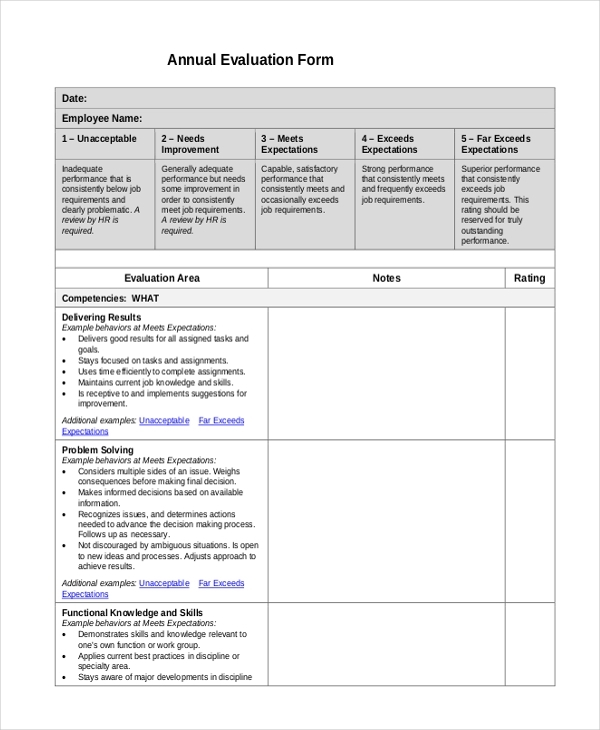 An employer or higher official in an organization uses this employee review template to evaluate the performance and other traits of an employee. This, in turn, helps the company to come up with plans to help in the employee’s development. 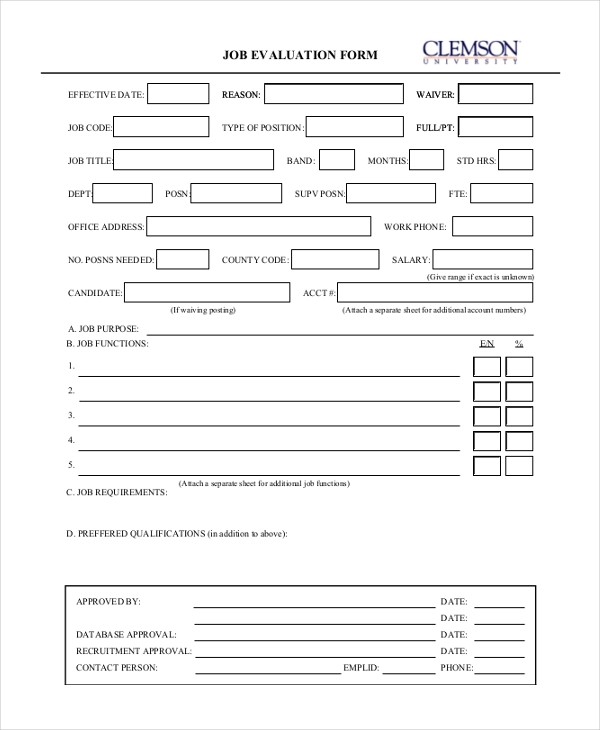 Whenever a student joins a company for a summer job or to gain a short term experience, he needs to get this form filled by the employer. The person is required to evaluate the performance of the student during the given period. 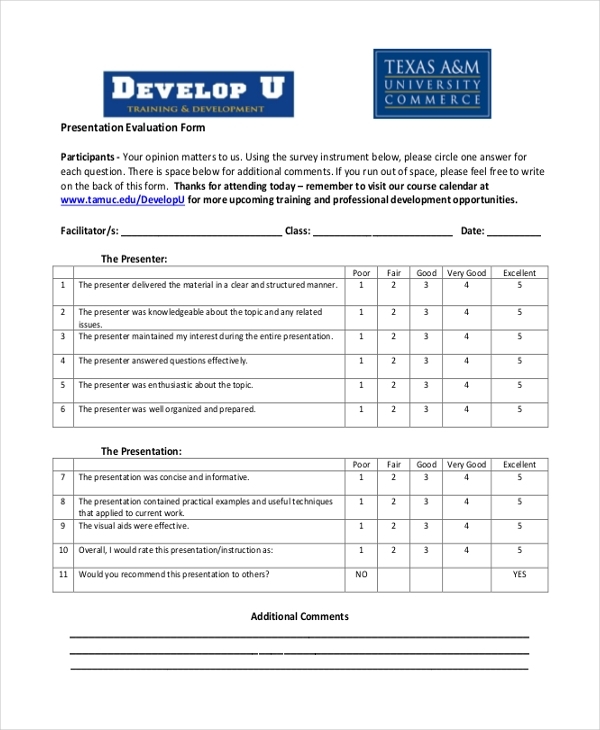 This form is used by educational institutions to gauge the performance of their faculty. The students are the ones who are expected to fill in this form which in turn helps the authorities to take necessary measures in improving the faculty. 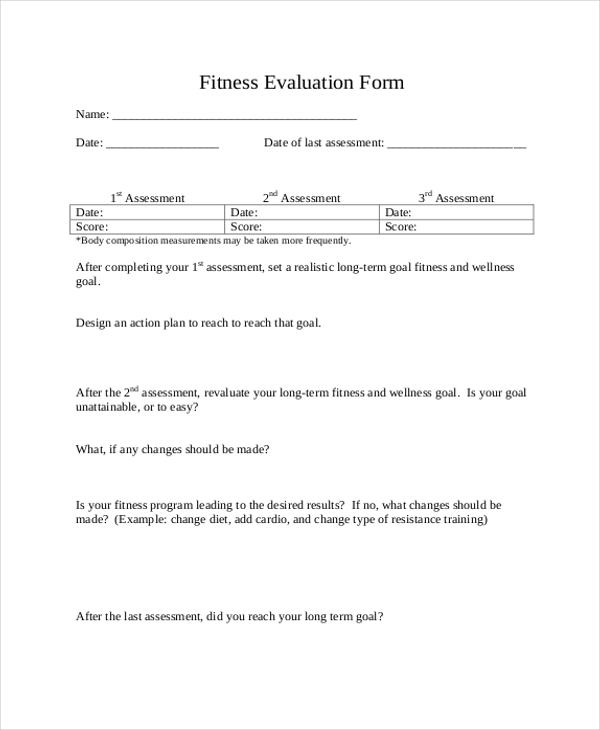 A fitness club or a fitness instructor uses a fitness evaluation form to assess its patrons fitness over a period of time. The form helps the person to evaluate its patrons against certain parameters. This form is usually used by caterers, restaurants and canteen services to find out what their patrons or customers think about the food. The person concerned is required to answer certain questions which in turn simplify the evaluation process. An interviewer or hiring agency uses an interview evaluation form to assess and evaluate a candidate. The form contains some questions which the interviewer needs to answer. These will help the hiring team to take an informed decision. Whenever a person joins a firm for an internship, he gets this form filled by the employer or his boss at the end of the internship term. The form evaluates the performance of the person as an intern which can be beneficial for him in future projects. 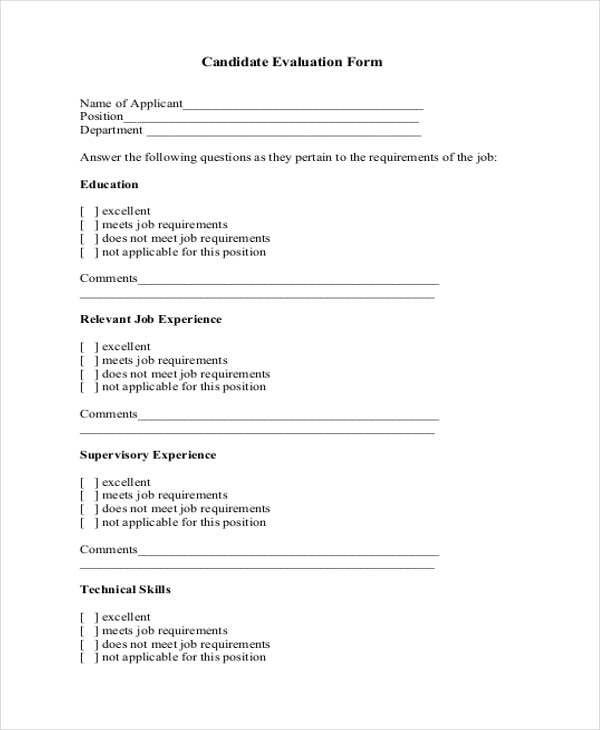 This form is used by an organization to evaluate the scope and significance of a job. The HR department of the company uses this form to help them decide a decent figure of compensation for a job. A business organization uses this form to evaluate the performance of its team leaders. The form is filled in by the team members and they are required to score various leadership traits of the leader that are mentioned in the form. Organizers of a meeting use a meeting evaluation form to understand what are the people, who are attending the meeting this form is about it. This gives the organizers a clear idea about the effectiveness of the meeting and how it can be further improved. 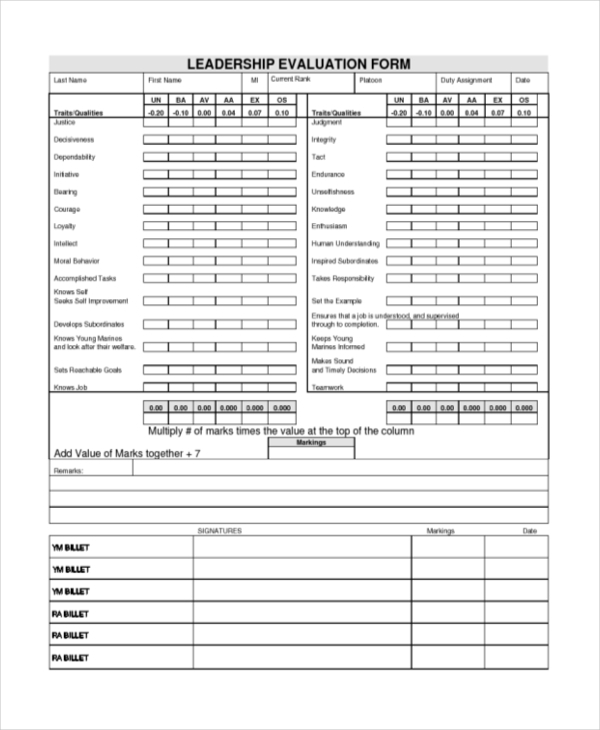 This form helps the manager to evaluate the performance of his team members. He needs to evaluate them based on various parameters included in the form. This makes it easier for the higher officials to understand the capability of the employees. 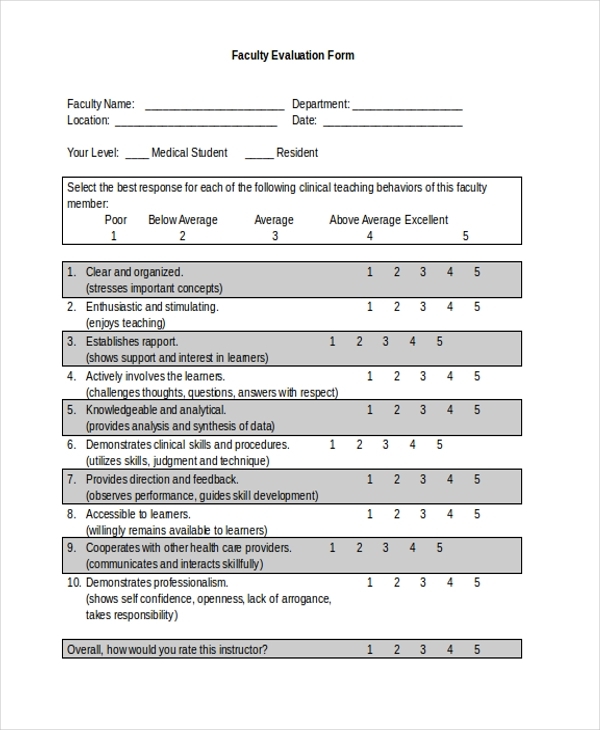 A nursing institute or training center uses this form to assess the performance and skills of the nurses. 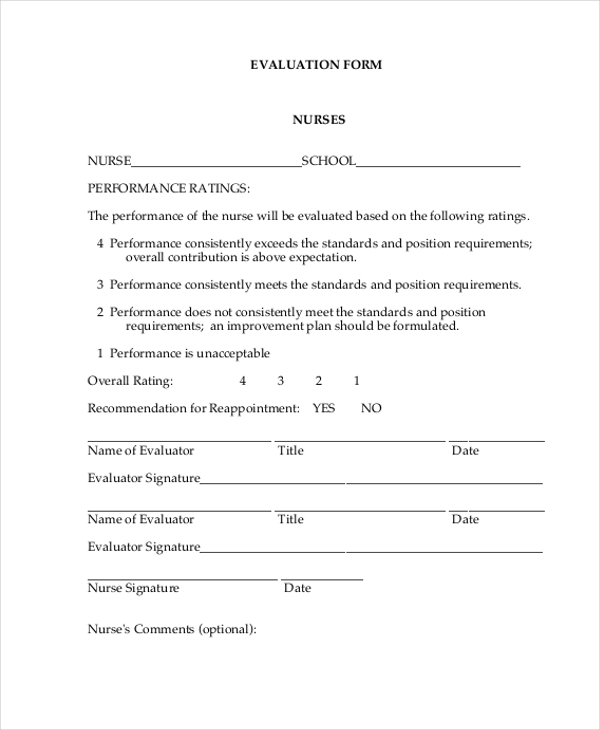 The form contains a number of parameters against which the nurses’ performance has to be evaluated. 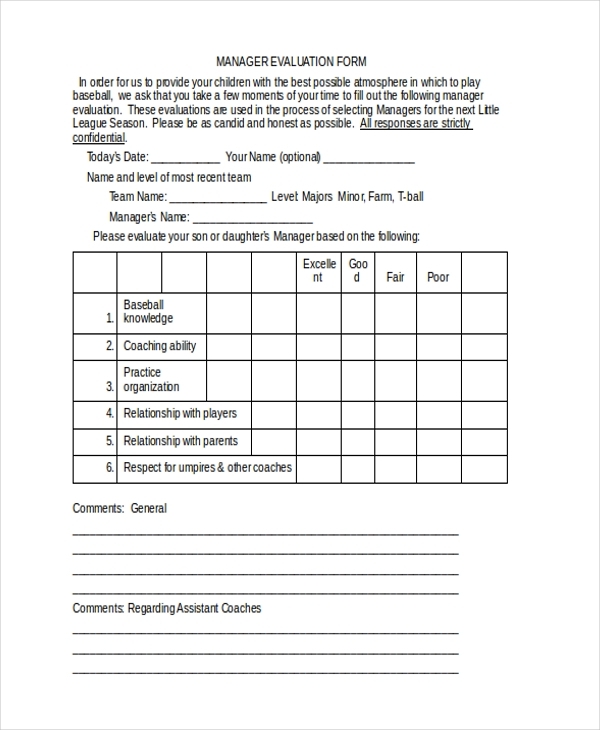 An agency that offers nanny services to clients uses this form to evaluate the ladies who work with them. The form comprises of a number of questions which makes it easier for the agency to evaluate the nanny. 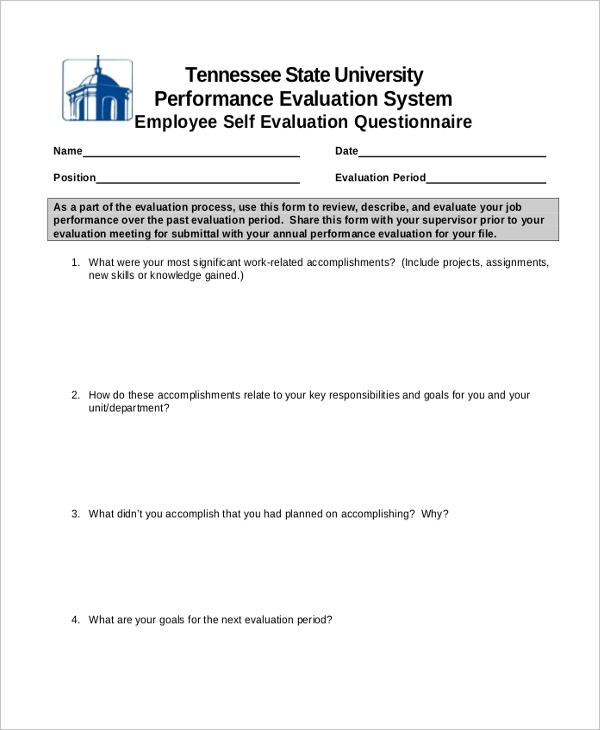 This performance evaluation template is used by an organization to evaluate the performance of its employees over a given period of time. The person concerned is required to do the evaluation based on the various parameters mentioned in the form. This form is used by an organization to enable its employees to evaluate their colleagues based on various parameters. This helps the organization to reward the deserving employees. A person or agency that makes a presentation to present an idea usually uses this form. At the end of the session to find out what the participants thought of the presentation. 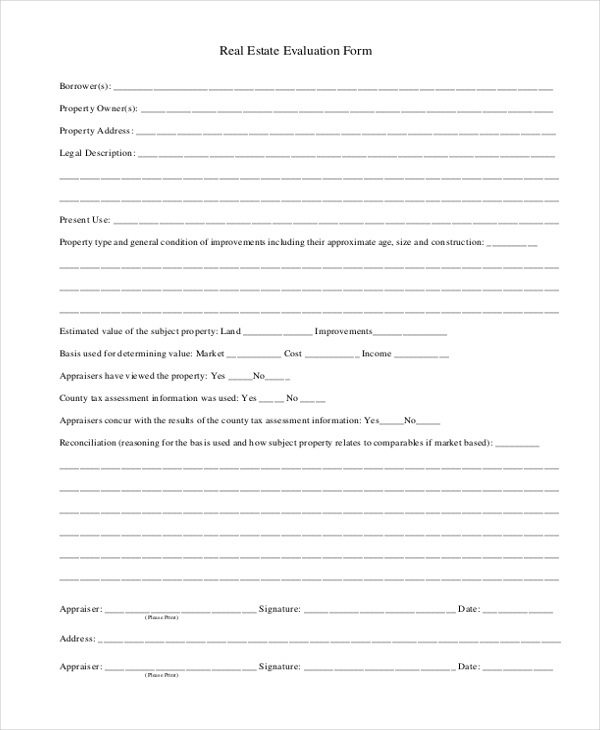 This form is used by a real estate agency or broker to evaluate a property that might have come up for sale. By evaluating the property against certain parameters, the agent can ascertain its condition and come up with a quote price. 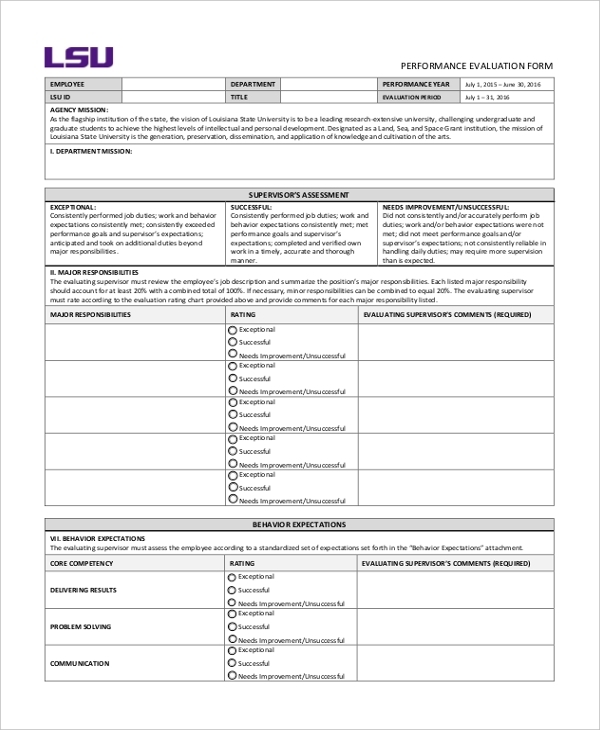 A person who may want to evaluate his personal skills and goals before a major interview or promotion can use this form. The form contains important parameters that make it easier for the person to evaluate himself. 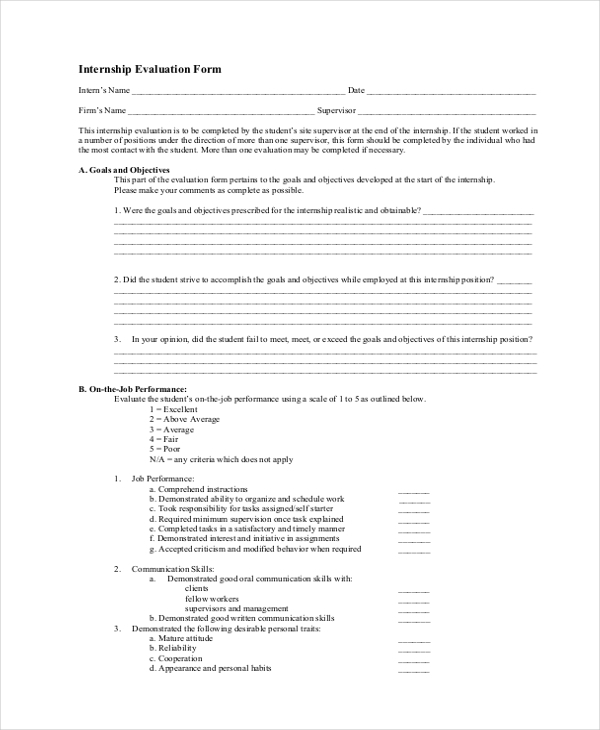 A student who may be working as an intern at an organization uses this form to get a formal evaluation from the employer. 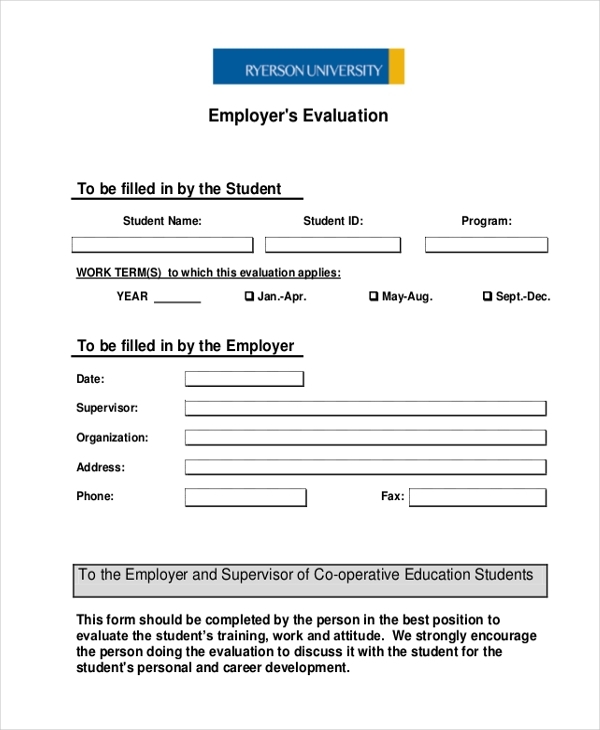 This form makes easier for the employer to evaluate the student’s performance and submit the details to the university. 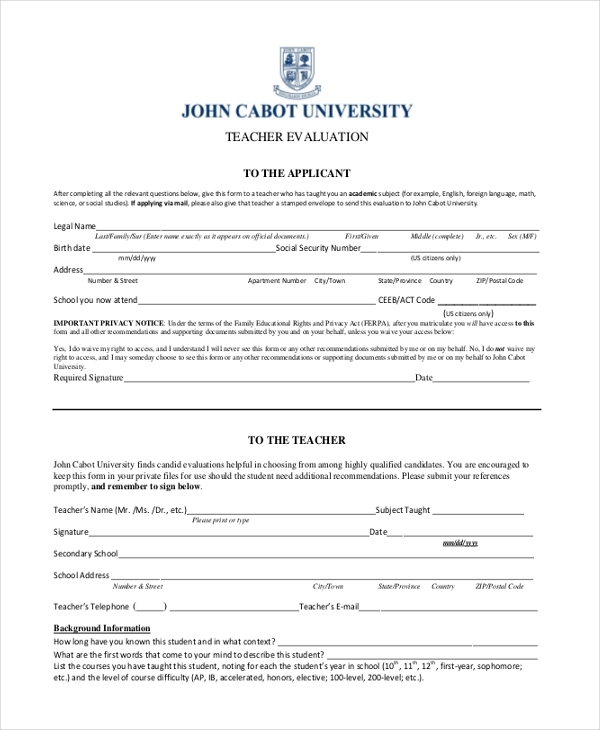 This form is generally used by an educational organization to help the teachers evaluate their students. The teachers are required to fill in all the subheads which will help the authority to gauge the traits and character of a student. 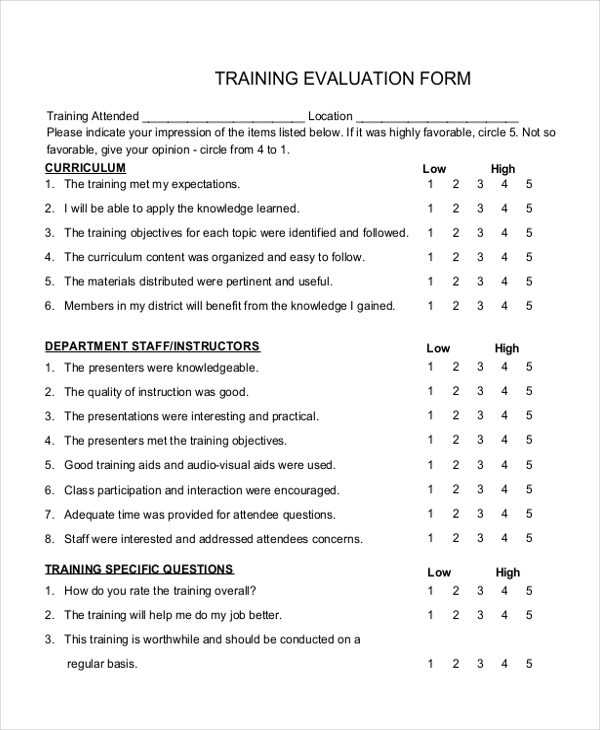 A training agency or trainer hand over this form to the participants of the session to offer their feedback, which in turn helps the trainer to understand his positive and negative traits work on them. Evaluation forms can be extremely beneficial in making important assessments in your daily course of work. However, if you are not sure how to design these, don’t worry. 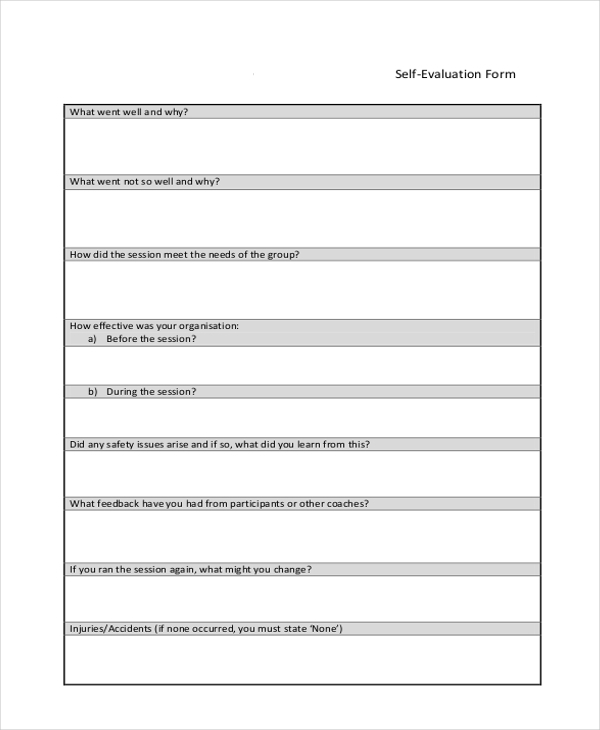 Check out our vast collection of evaluation forms online. These are easy to download and are available for all purposes. The best thing about these forms is that you can customize these to suit your requirements.